Am I missing something here? It looks like US Agent picked a fight and Hawkeye accepted; that's a really stupid thing to do given their respective power levels but Clint does seem to have the moral high ground. 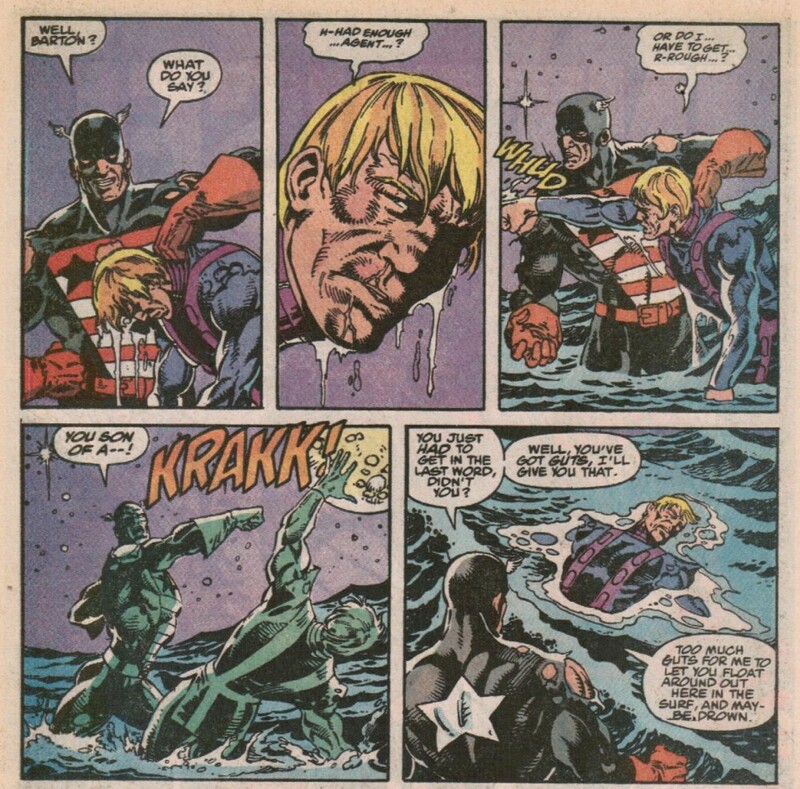 In creating USAgent, first known as Super Patriot, Mark Gruenwald wanted a kind of mirror image for Steve Rogers. John Walker was from the south, grew up on a farm, and joined the army when there wasn't a war on. 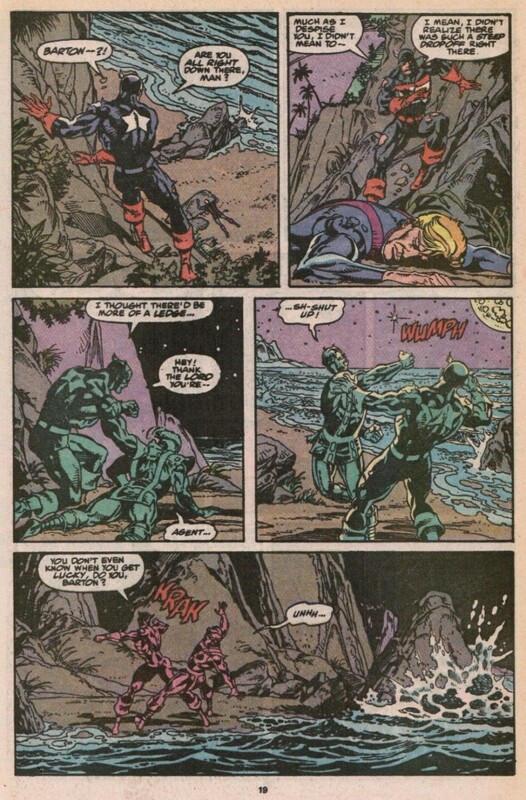 Various other creators turned him into a jerk with possible mental issues. 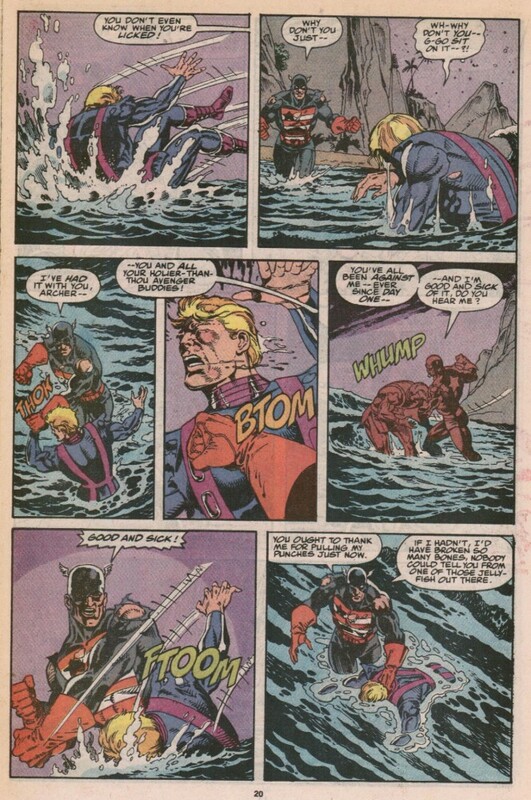 I thought Gruenwald was the one who wrote an emotionally unstable John Walker beating a number of Watchdogs to death? 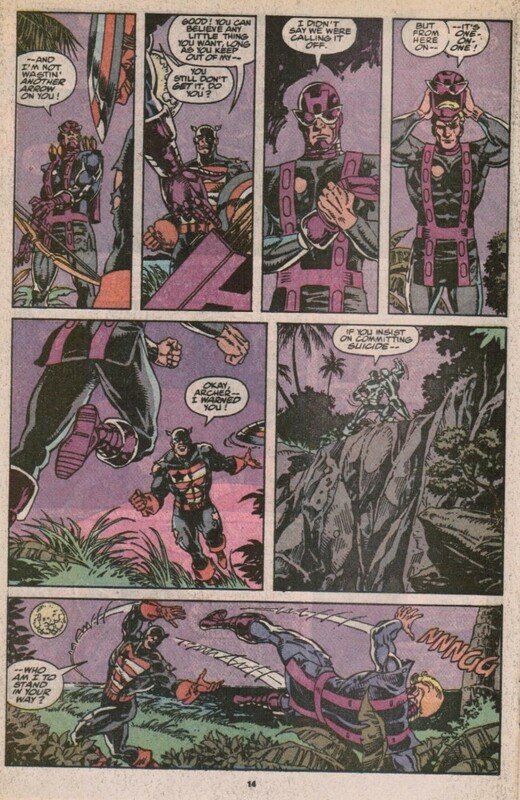 Wow, look at Agent getting his story straight for when he has to explain a dead Hawkeye. "I didn't mean to-- I mean, I didn't realize there was such a steep drop over here. Yeah, that's it." He's done this before. I have a soft spot for street level heroes, so I've always enjoyed Hawkeye. Some make him out to be a cheap Green Arrow knock-off, but aside from the bow, the character's couldn't be more different. Ollie operated at street level most of the time, but when he occasionally got called up to the majors, he didn't get a major power boost like some street level guys (coughBatmancough). He was never anything more than a guy with a bow. And a super-hot girlfriend who is one of the top ten fighters in the world. Hawkeye has always had this streak of self doubt/chip on his shoulder about being the shortest guy on the basketball team. He's a good leader, but that flaw does rise to the surface now and again. I really dug his recent series, because it made him actually operate at the street level, where is is quite the badass. 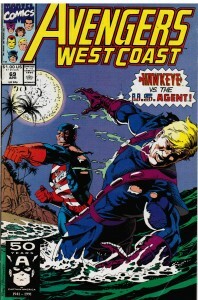 His character design in this issue? Yikes. I'd rather trade for Hank's red jumpsuit. "You can all go the blazes" seriously is Marvel run by the language police? "Good and sick. GOOD AND SICK"
"He got the Spit knocked out of him!" "I'll flaming gut that guy, bub!" And so on. I mean, it wasn't until the 90s that the CCA started to fade away and the pretense was dropped. 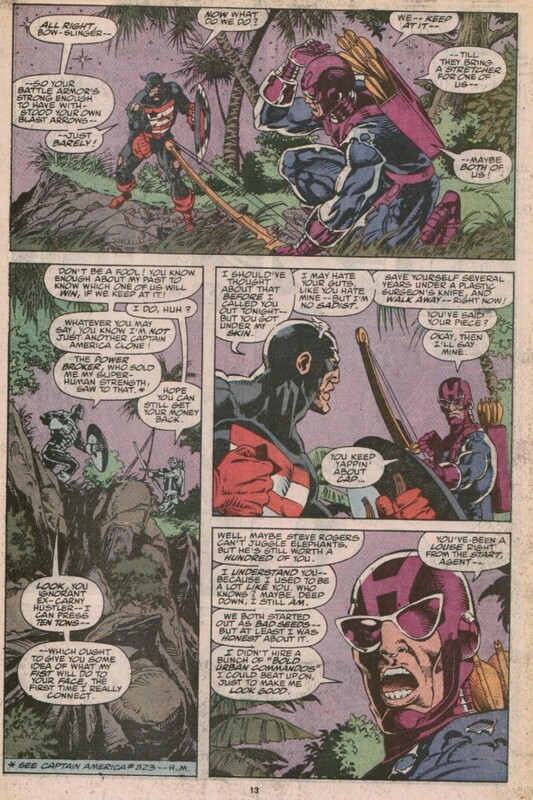 It's also Roy Thomas. I think he invented most "not really swears." I really despise Jeremy Renner. I really do. Its transferred to comic Hawkeye for me. He's unbearable. I was always partial to the Hawkeye persona of EMH. Oh from the Avengers cartoon Earths Mightiest Heroes. Heh, Hawkeye's a Happy Days fan! 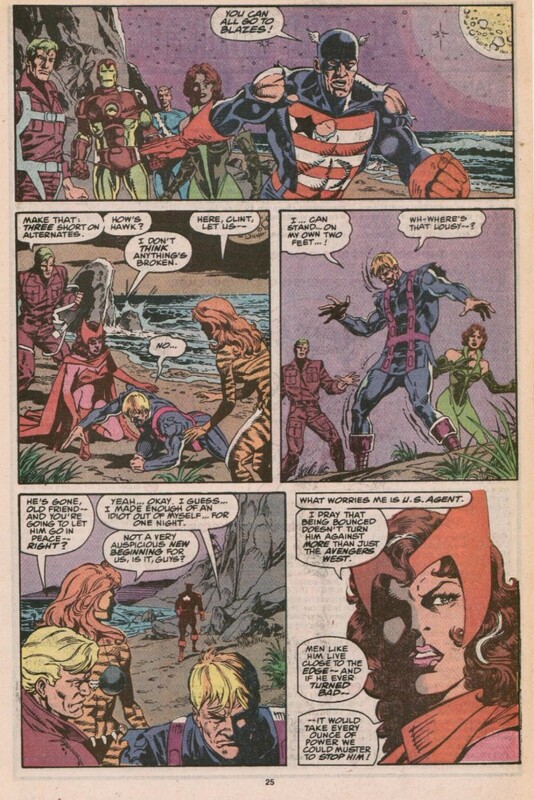 Wow....that's some serious comic-book melodrama with Wanda overselling USAgent big-time. Everything they have? I'd put decent odds on almost any single member of that crew being able to take down USAgent by themselves. Some with more difficulty than others, but still. 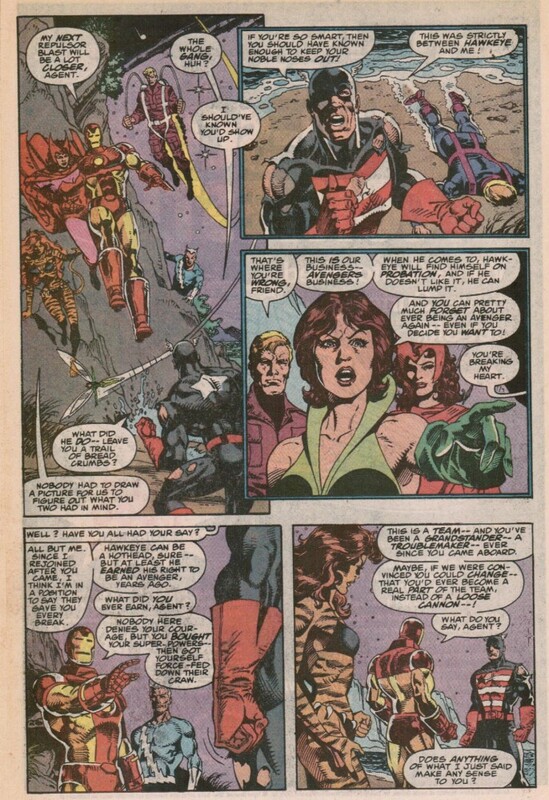 Iron Man would totally give USAgent another chance later on with Force Works. Poor Walker. 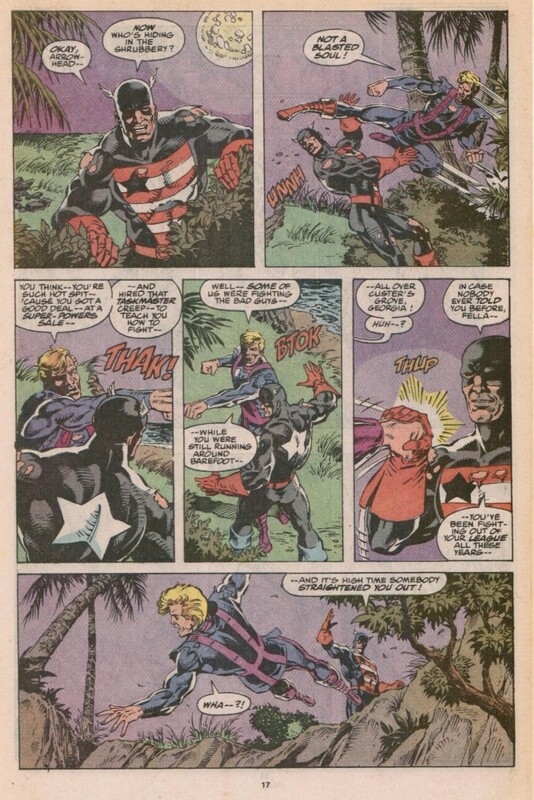 IIRC, he was created to make Rogers look good, at a time when most readers had become suspicious of government (and when "rebel" characters were getting more popular). So Rogers was written as "following the American Dream" rather than taking orders from the government, and Walker was the opposite. All of Walker's flaws were designed to make us appreciate Rogers more. 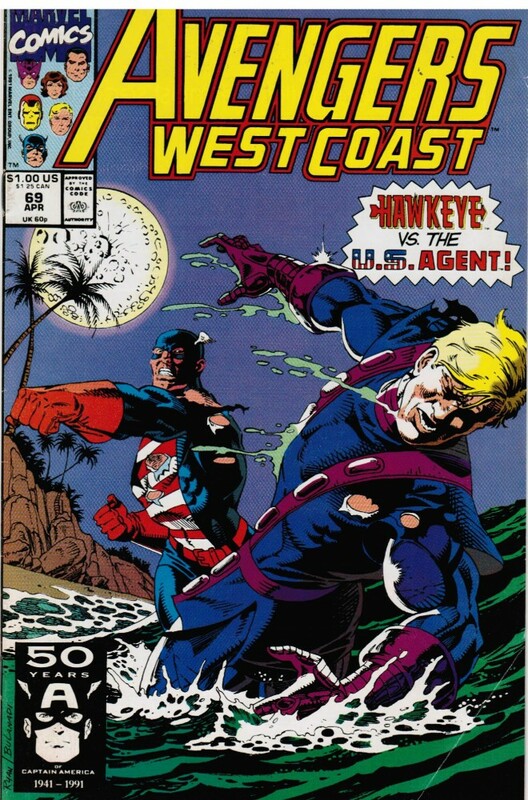 Thankfully, their characters have diverged somewhat since then, though original Walker was effectively reincarnated as Ultimate Cap.